Our Solutioning team have team up with a serveral technology partners to offer a wide product range of fully integrated IP or Standalone digital intelligent intercom systems, Emergency and Information Help Point Systems, and flexible Multi-channel/Multi-zone Public Address Systems. 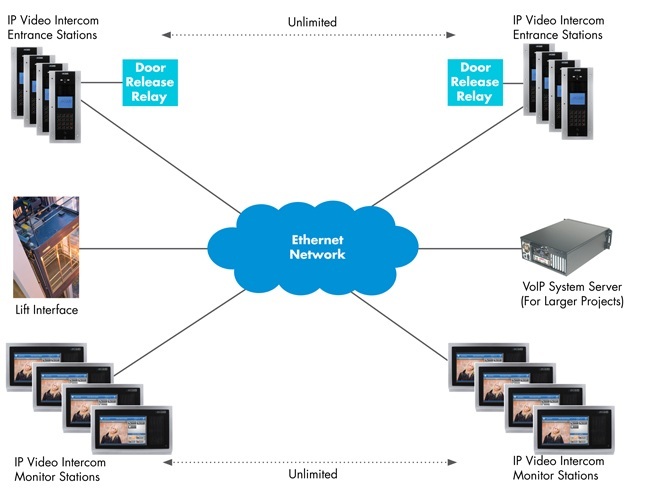 Based on the proven and reliabl Internet Protocol Platform, the Ethernet networks serves as an extremely flexible and scaleable system allowing for an unlimited number of entrance and monitor stations. All video, data and audio is carried over this Ethernet network. The IP video intercom is powered via PoE to further reduce installation and wiring costs. Further, the system has established interfaces to third party systems such as security management systems (SMS), CCTV System and other system over the networks.